The item I purchased was for a family member who does not have access to the internet. He is very pleased with his purchase, as it has now made switching between the Set Top box and the DVD player a much simpler task than previously. I was very pleased with the quick receipt of my purchase and the way it was packed. Once again, thanks for a very professional service, and I hope to do much more business with cable chick in the future. 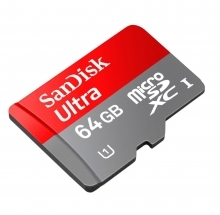 64GB SanDisk Ultra Micro SDXC Memory Card with SD Adapter (Class 10 UHS-1) + FREE SHIPPING! Provides 64GB* of memory in one tiny card for all Micro SD (SDXC) compatible devices, and SD Card (SDXC) devices via included adapter. Please note that SDXC cards are not compatible with most devices released prior to mid 2012. Supports up to 100Mb/Second speed. Extremely high spped, and high capacity in the tiniest of form-factors! With just about every new device supporting MicroSD cards these days, this is the most ecconomical way to expand the storage capacity of your SDXC supporting devices, including smartphones and tablets. From your digital camera to your Android smartphone to your fancy new smartphone wristwatch, we all crave more space for more stuff whether its movies to watch, music to enjoy or games to play. This Expanded-Capacity Micro SD card (SDXC) offers 64GB* of storage in a little memory chip the size of a fingernail. It's a Class 10, UHS-1 speed rated card, making it one of the best and most versatile bang-for-buck options on the market - perfect for video capture in camcorders or GoPro cameras! For easy USB access without any fuss, our Compact USB Card Reader is a great optional accessory. Note: Please check your device is SDXC compatible first, as we are not able to refund this product if purchased for a device which does not support SDXC.